This recipe for Magic Bars was inspired by our trip to Walt Disney World last year. It was one of our favorite desserts that they make at our resort. By one of our favorites, I really mean one of our favorites! The food is so good there it was hard to choose which dessert to get! We have been there a few times and each time we have stayed at Port Orleans Riverside Resort. The resort is so nice and you forget you are at a Disney park area because it is so quiet and relaxing there. All four of us are Disney fans. There is something about being at Walt Disney World that brings out the kid in all of us and is so magical. 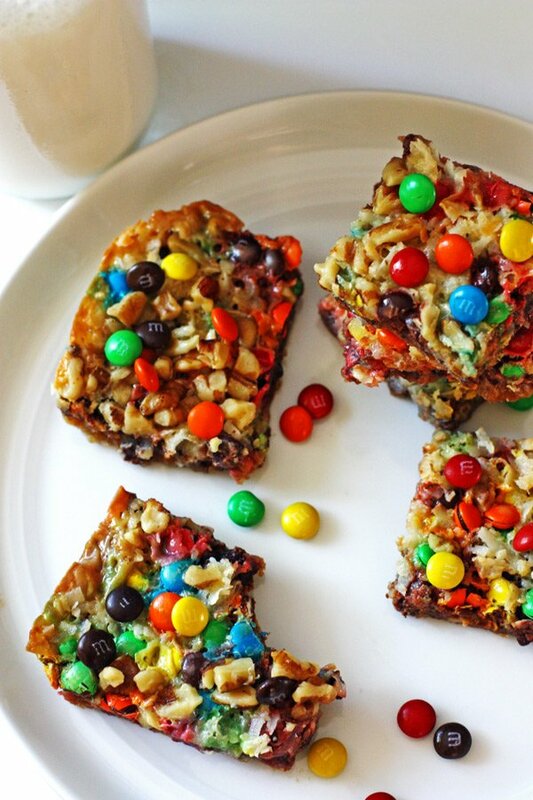 Speaking of magical, these Magic Bars are something you really should try! At Disney, they use butterscotch and chocolate chips. While that was delicious made that way, I took out the butterscotch chips and replaced them with mini M&M’s. (The reason why is because I forgot to buy butterscotch chips and had the M&M’s in my pantry…and did not feel like running to the store one more time!) Luckily, it worked and not only did it work, we liked it better this way. It was not so sweet than with the butterscotch chips. They are so easy to make! Just crush up the graham crackers until they are fine crumbs. I used about one sleeve of graham crackers. I would highly suggest using parchment paper in your pan so they come out easier. The first time I buttered my pan and they were a bit difficult to come out of the pan. So parchment paper has become my friend in cases like this! :o) If you do not have parchment paper handy and are going to use butter, just make sure you grease the pan generously. Once you have your graham crackers finely chopped, add the melted butter to them and mix well in a bowl. Place the crumb mixture into your prepared 13×9 pan and spread it out to form a thin crust. I use the back of a fork to spread it out. And, you might think this will not be enough to cover the bottom of them pan (like I do each time!) but it will. 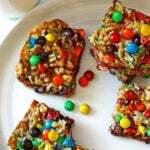 :o) Then just cover the crust with mini chocolate chips, mini M&M’s and coconut. Next, drizzle the sweetened condensed milk over the entire pan, making sure to cover it completely. Sprinkle the walnuts evenly and bake for 25-30 minutes at 350⁰. Let them cool and cut into squares. They can be stored at room temperature, but this last time I put them in the refrigerator because it was so warm. I have to tell you, I think eating them chilled makes them even better! So once they are cooled and cut into squares, and of course, you eat a couple of them, cover them and place them in the refrigerator. Enjoy! So, this and Mickey Mouse ice cream bars are at the top of my list for Disney desserts. What is your favorite one from the park? Line 13x9 baking pan with parchment paper or generously grease the pan. 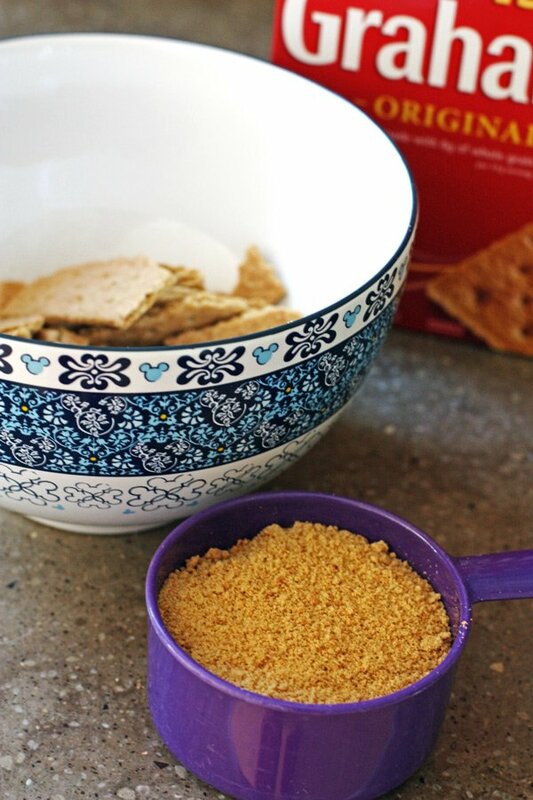 In a bowl, crush the graham crackers into finely chopped crumbs. Add the melted butter to the crumbs and mix well. Place the crumb mixture into the pan and spread out to make a thin crust, using the back of a fork. Cover the crust with the mini chocolate chips, mini M&M’s and coconut. Drizzle the sweetened condensed milk over the pan, covering it completely. Sprinkle the nuts evenly on top. Bake at 350⁰ degrees for 25-30 minutes. 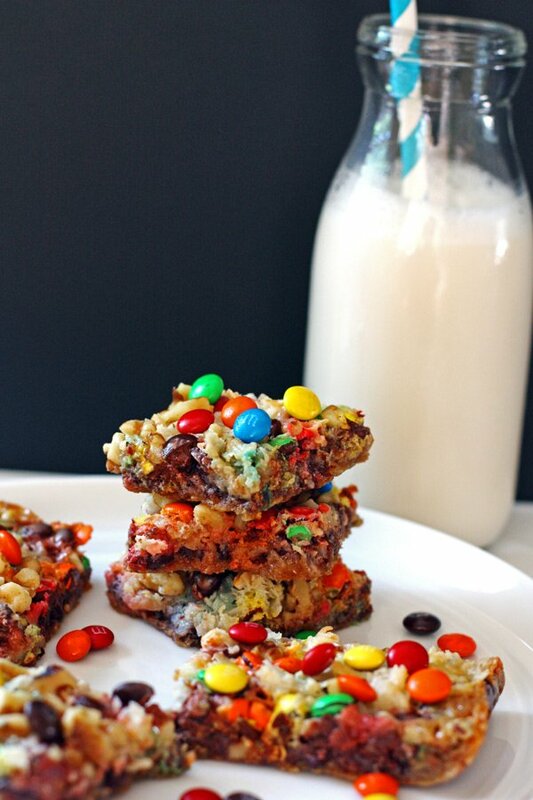 Optional: Gently press a little more mini M&M's onto the Magic Bars once out of the oven.